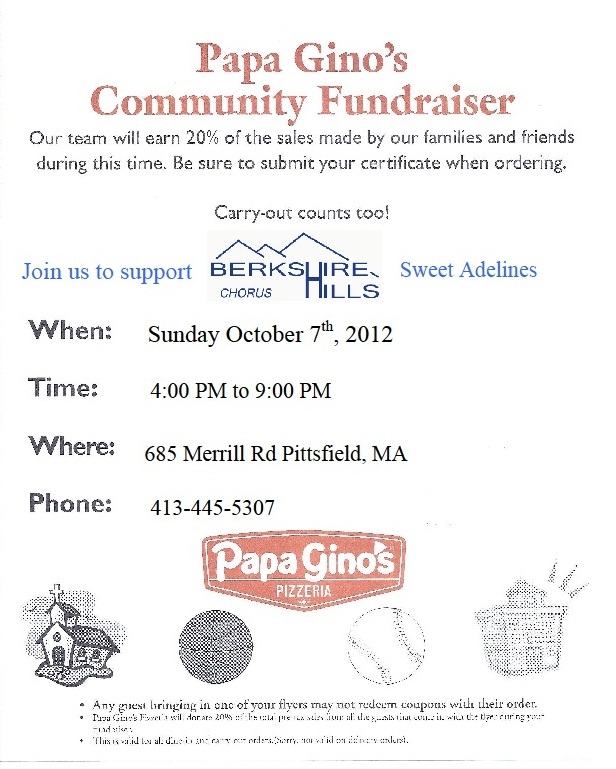 This Sunday, October 7th, we will, be hosting a fundraiser at Papa Gino’s on Merrill Road in Pittsfield. Between 4:00pm and 9:00pm that day, show one of our flyers with your dine-in or takeout order (sorry, this offer is not valid on delivery orders) , and 20% of your bill will be donated to the chorus. You can ask one of our members for a flyer, or print out the flyer below. We hope to see you there! Previous Post Dining to Donate at Arizona Pizza! Next Post Membership Open House – April 2nd!